In Nigeria, Stella Mojekwu pauses with worry when she sees a seemingly commonplace view: women applying lotions, deep frying foods to eat, and handling other oil-based products. As the Chief Environmental Scientist at the Federal Ministry of Environment in Nigeria, Stella wonders if they contain polychlorinated biphenyl, a chemical substance more commonly known as PCB. 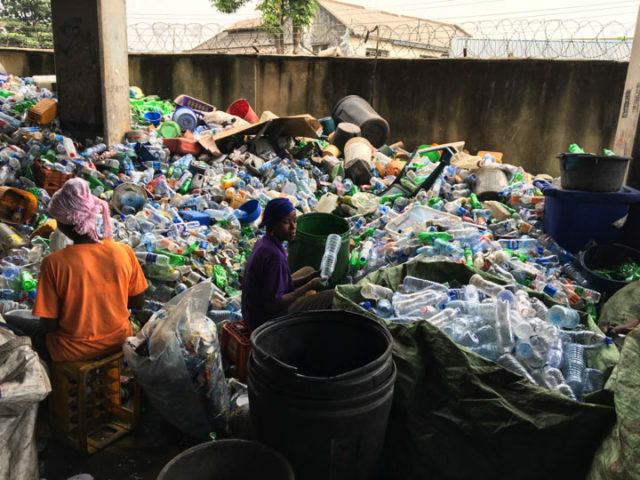 Community-based household waste collection and sorting business “WeCycle” which is run by an engaged young Nigerian female entrepreneur, Billikis Abiola. An organic chlorine compound with high solubility in most organic solvents, WECF International has also noted that PCB, which is often found in transformer oil, is used by Nigerian women in as wide a range of activity from cooking, to producing lotions, cosmetics and even treating head lice. Difficult to break down, PCB has largely remained in wide use due to its longevity, i.e. to extend the use of cooking oil. However, such perceived benefits come at a steep cost: PCB is a recognised carcinogen that has also been found to be the culprit in cases of endocrine (or hormone) disruption and neurotoxicity. the BRS Conventions share a common objective of protecting human health and the environment from hazardous chemicals and wastes. In 2006, the three Conventions started a process to enhance their cooperation and coordination while maintaining their legal autonomy, including by developing a joint Secretariat in 2012. Broadly, the Basel Convention covers explosive, flammable, reactive, poisonous, infectious, corrosive, toxic or ecotoxic hazardous wastes. The Convention requires Parties to control their import-export of wastes, as well as taking measures to ensure that hazardous waste by-products are reduced to a minimum. The Rotterdam Convention obligates Parties to implement regulatory actions for pesticides and industrial chemicals that have been banned or severely restricted by Parties due to health or environmental reasons. In the Stockholm Convention, Parties must eliminate 15 named pesticides and seven industrial chemicals and chemical by-products, of which PCB is one. The most recent Prior Informed Consent (PIC) Circular of the Rotterdam Convention, developed biannually and circulated to Parties by the Rotterdam Convention to provide relevant information on chemicals. As key stakeholders reflect upon the current, baseline status of the objectives of the BRS-GAP, the results of the study are encouraging. A staggering number of initial NIPs (91%) contained at least one gender and/or women keyword – indicating recognition to some extent of gender considerations and, most commonly, the differentiated impacts of chemicals and pollutants on women and men. Yet, Parties are not yet fully integrating or mainstreaming gender considerations within their planning and reporting documents. The study finds that there are many available entry points for enhancing gender mainstreaming to achieve the objectives of the BRS-GAP and the obligations under the Conventions. Some areas of consensus that appeared at the recent BRS COPs include a focus on public awareness raising, education and capacity building to ensure a safer, more sustainable, and more equitable future for all. Click here to read the full report analysing Women’s participation and gender considerations in country representation, planning and reporting to the BRS Conventions. The BRS Secretariat includes the UNEP-administered Secretariats of the Stockholm and Basel Conventions, and the UNEP-administered part of the Rotterdam Convention Secretariat; the joint Secretariat works closely with the FAO-administered part of the Rotterdam Convention Secretariat. This EGI analysis, as well as WECF projects in Nigeria and Indonesia, is part of the BRS Secretariat-coordinated, Integrating gender issues into the implementation of the BRS Conventions project, with support from the Federal Government of Germany and the Government of the Kingdom of Sweden.